Molly Watson. The Spruce Eats, 2013. A bit of salt and pepper before being cooked is about all you need in terms of seasoning an excellent grilled steak. However, the French have a habit of adding a knob of butter on top of a hot steak. The heat of the steak melts the butter into a simple sauce, adding flavor—and a bit of flavor-carrying fat—to make a steak shine. A compound butter lets you add a bit of flavor to all that juicy-enhancing fat. We usually make blue cheese compound butter or classic beurre maître d'hôtel for steak, but the other day the cupboard was pretty bare. 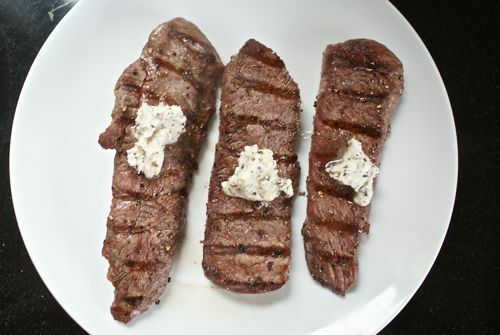 So we simply mashed some freshly ground black pepper into some softened butter and added that to our top sirloin steaks. Magic. The fat of the butter softened the pungency of the pepper while highlighting is aromatic properties. As the butter melted from the heat of the freshly cooked steak, it carried that gentle heat and flavor with it to each bite. In a small bowl use a fork to mash together 4 tbsp. softened butter and 1/2 to 1 tsp. freshly ground black pepper. Dollop about 1 tbsp. on each steak. Double or triple (or more) if you like. Like other compound butter, this one freezes beautifully. Black pepper is such a great combination with beef. This butter is also divine when plopped on a burger. It's an especially useful technique for countering the more intense flavor and leaner nature of grass-fed beef​ or adding some moisture back into well-cooked burgers.